Corona, CA – CIRCOR Aerospace, Inc., a CIRCOR International, Inc. company (NYSE: CIR), announced a $1000 donation to the California State Polytechnic University at Pomona Engineering Lab Revitalization Project. Recently retired Dean of Engineering Ed Hohmann left a legacy plan in place to sponsor the future development and construction of a state-of-the-art learning center. The current engineering laboratory opened in 2001 and added nearly 118,000 square feet of classroom and laboratory space for the college. This new revitalization fund will sustain ongoing facility improvements. 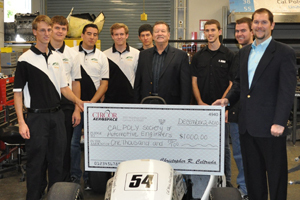 CIRCOR Aerospace has been a long time sponsor of the Engineering School and gives annual support to the Formula and Baja Society of Automotive Engineers (SAE) Racing Teams as an enhancement to its engineering student internship program. Cal Poly Pomona engineering students have access to machining, programming and raw material sourcing courtesy of the company, as the intern partnership plays an important part of a successful future.